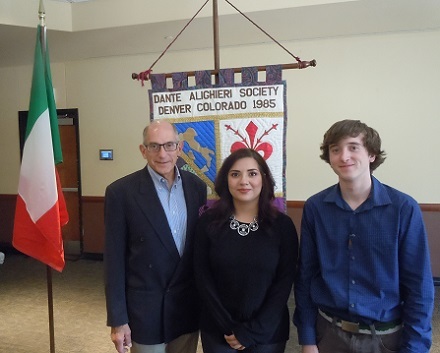 The Dante Alighieri Society of Denver annually awards scholarships to deserving college students to advance their study of Italian language, music, and art in Italy. Scholarship applications for 2019 are open. Please click on the appropriate button below to fill out the application. For any additional information, contact Dr. John Giardino, Chair of the Scholarship Committee. 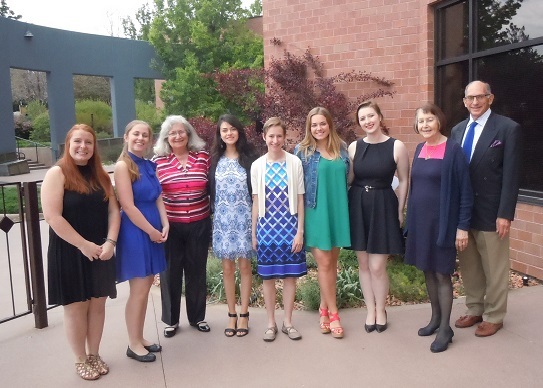 On Sunday May 6, the annual Scholarship Awards Luncheon took place at the Arvada Center for the Arts and Humanities. 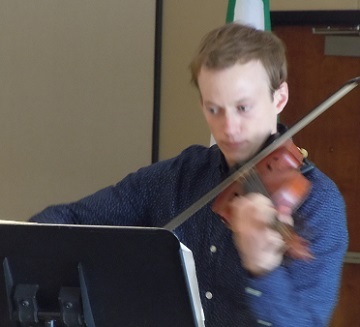 The nearly forty people in attendance enjoyed the opportunity to interact with our scholarship winners, a breathtaking violin performance from our music scholarship winner and a sumptuous meal. 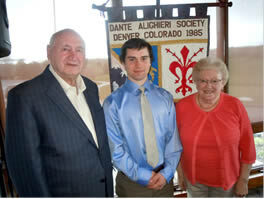 A heartfelt “Thank You” goes out to all who have contributed to the Dante Scholarship Fund. This most important part of the Society could not continue without your support. 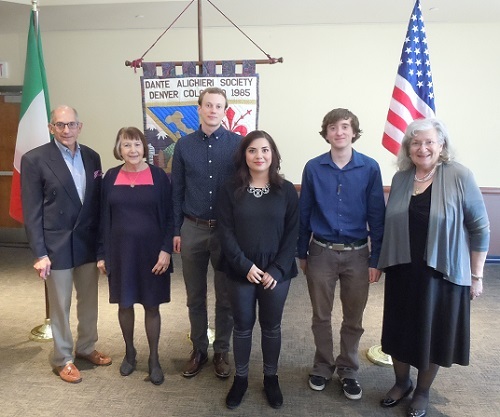 Our scholarship winners for 2018 are the following: Gian Aurand, from Metropolitan State University, received the Giulio Marcantonio memorial scholarship and will be going to the University of Torino. Rebecca Leyva-Hernandez, from Metropolitan State University, will be studying at The Lorenzo de’ Medici International Institute in Florence, Italy. 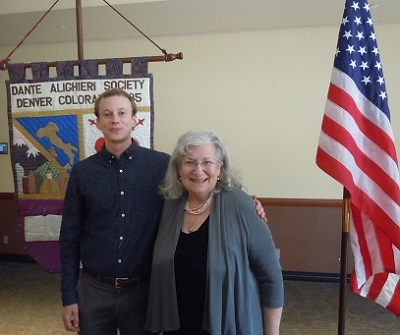 Seth Bixler, from the University of Colorado in Boulder, received the Vincent and Gay Taglialavore scholarship and will attend the Siena International Music Program. 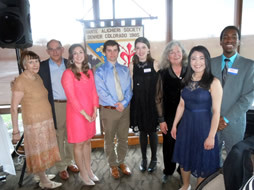 Grazie to chairpersons John Giardino and Rosanna Patrona-Aurand, and the scholarship committee. 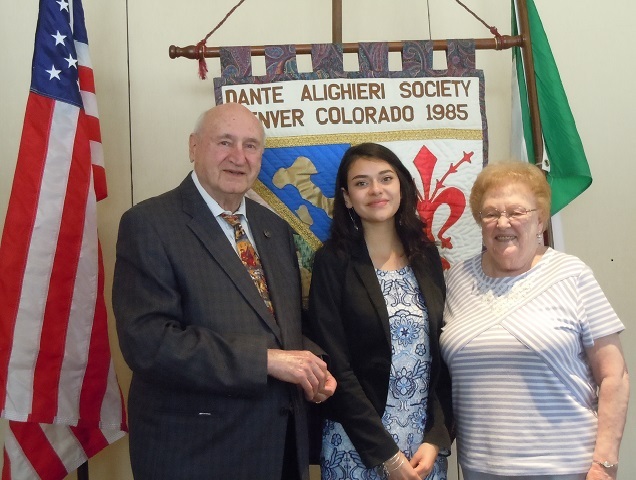 The Board of Directors of the Dante Alighieri Society of Denver wishes to thank the following individuals who generously contributed to the 2018 Scholarships as of April 30, 2018. To these and anyone we may have inadvertently omitted, our sincere thanks for your generous contributions to the Scholarship Fund. 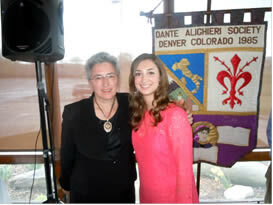 Madison Sleyster (CU Boulder), Celeste Landy (CU Boulder, Music), Rosanna Patrona Aurand (Music Chair), Denisse Romero (DU Taglialavore Scholarship)), Melissa Zinanti (Metro), Maisie Karlin (DU), Meghan Dulsky (Giulio Marcantonio Scholarship), President Veronica Goodrich, John Giardino Scholarship Chairman. Pictured: Vincent and Gay Taglialavore with Denisse Romero.